The "Due East"! fall fundraiser kicks off Big Medium's two weekends of the East Austin Studio Tour and will be the first opportunity to explore and purchase the work of over 300 EAST artists featured in the group exhibition. It will also be an opportunity to get a copy of the East Austin Studio Tour catalog: a free, full-color book that serves as both an invaluable reference of the art community and a beautifully designed collector's piece. Attendees will be able to dine on sumptuous bites from local top restaurants and enjoy Tito’s Handmade Vodka mixed cocktails and Dos Equis beer. Musical entertainment will be provided by chamber pop group Les Rav and DJ Bigface. 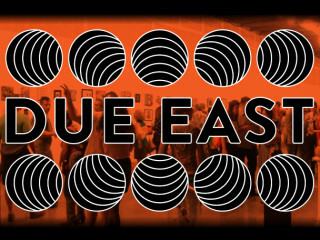 All event proceeds help fund Big Medium’s EAST programming, including the EAST Fellowship Program. Big Medium is taking over 1501 E 6th Street and transforming the vacant Nuevo Leon restaurant space into an arts destination for a limited time only, November 6-23, during the EAST Group Exhibition. You can purchase your tickets in advance here. $50 in advance; $65 at the door. Tito's Handmade Vodka, Dos Equis, KIND, Zipcar, Austin Eastciders, LoudMouth Rentals, Hillside Farmacy, Salt & Time, Uchi, Contigo, Lick Ice Creams, Whole Foods Market, Wunder-Pilz Kombucha, Industry Print Shop.